This chapter highlights the folly of thinking that we know what’s good or bad, or that we can control things outside ourselves. It begins with an observation about government. The Tao Te Ching’s passages on government are consistent with the view that the “government is best that governs least,” or with the concept of a “servant leader.” This is challenging to apply to today’s world when the more traditional social structures of villages and small communities are missing in much of the developed world. So I prefer to consider these “government” passages in relation to our own individual self-government. Then the message of the text is easier to discern and apply. When I am overly harsh with self-criticism, or overly strict with rigid rules, I lose my connection with the divine energy that moves all around me and through me. If instead, I remain fluid and in alignment with this energy, then, to borrow from Buddhist terminology, “right action” naturally and effortlessly occurs. The characters for good fortune/joy 福 and misfortune/misery 祸 have the same radical, or root, meaning to reveal, as in a sacred revelation. This suggests that good fortune and misery are both rooted in holy origin, both part of the divine dance of life. The chapter goes on to explain that when we impose our rigid standards of judgment (like an oppressive government) on our experience, we become confused and misguided. However, when we drop our judgments of good and bad, our attachment to pleasure and our aversion to pain, we can see everything as it is. We take our place in the divine dance. The "shock" perhaps is recognizing the natural consequences of our actions, whether individual or national. Pema Chodron writes that if we really understood how much misery we cause ourselves and the world, we would practice [good habits] like our hair was on fire. I've always loved that image. Very motivating! 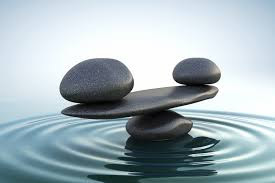 These are indeed challenging times, and finding my own inner balance is definitely right action. I especially like pondering the fact that misery and joy can be so interconnected. My first blog was about developing habits to grow a joyful spirit. Now I'm recognizing that while my "default" position is now joyful rather than fearful, I failed to allow and integrate sorrow and grief into the joyful "mix" thereby stunting the joy to some degree. Joanna Macy said, "The heart that breaks open can contain the whole universe." It's so true that when we become too judgmental and controlling, we lose the joy of simply being in the moment. And I love the quote from Wang P'ang! Thanks, Martha. I love that quote as well. I've learned so much from contemplating breath. Galen, this chapter is similar to the last one, on the need for less interference from authority and institutions. When I was in my early adult years(20-50). I was way, way, way too religious,in retrospect. I was self critical,and judgemental towards others, I was trying to live by strict rigid rules to please my unrealistic standards that I had set for myself and it reflected in what I expected from others and how I saw them. Somewhere along the way I had lost connection to divine energy and source. I called it my spiritual dry period back then. I knew I was lacking the connection but I had no idea how to overcome this sense of separation from the divine. It was years later that I realized this idea of separation was something that was illusory, I had been wrong all along.I had been led to believe from years of indoctrination that I was not good enough as is, and short of a reliance on a savior figure I was eternally lost and separate from what we call God. I believed connection with the divine could only happen by an act of grace and a system of merit set up by the distant deity. Its interesting that when I dropped my certainties and the assumed self rightness that goes with along with certainty of perceived truth, that I was able to finaly relax in the great mystery of life and enter that flow of life which is all around us. I realized that I am already connected to the energy of life, how can I be separate from life. I am part of the divine dance.How can I label that bad or good ...it just is. I now worship Life and there is no separation, no good or bad, no unrealistic expectations. There is just this one Life and we are that.It just is. Thanks for sharing some of your story, Brian. The Tao Te Ching says elsewhere that what is rigid, dies. What is flexible, lives. When we bind ourselves up with rigid rules, whether externally or internally imposed, we block any movement of natural energy. Lovely description of being part of the divine dance. I love this post, Galen. It sums up for me what I felt myself leaving behind after my midlife 'revisions'. My attachments and self judgments were making me so unhappy - I was not governing myself very well. I now govern myself through my values - I check in with them whenever a challenge presents itself or when I need some self guidance, but I also try to allow myself to flow and the outside world to flow around me at the same time. This is what I aim for and practice doing. And it is so much lighter a way of being.Positives have negatives within them, and vice versa, so joy and sorrow are indeed closely related/interlinked. I very much like you choosing to interpret this chapter as relating to self governance as well as world governance - food for thought and stimulating as ever. I like that term, midlife revisions, Lynne. Funny and true. We get to a point in life and have a perspective that allows us to see, if we are willing to look, what serves us and what doesn't, what is helpful and what isn't. Your description of positives and negatives containing each other is represented in the tai chi yin/yang symbol. Checking in with your values for insight and guidance keeps you aligned with this natural energy of Tao. I have been reading your posts and commenting but having problems with google making some changes. I really enjoyed the one you wrote on the neighbor making cookies for you. I love true ministering and that was a precious moment of a friend seeing a need and meeting it. I always love your poetry. I have read this one through a few times and find it interesting as always. I still at times feel like Tao has many interesting parallels with my own faith beliefs, which doesn't surprise me because spiritual truths and doctrines have been here since Adam and Eve. However, at some point some of these truths found their way into other philosophies in fact in many different religious thoughts. I'm not sure with this one where I see any sameness. I find great peace in my own faith and belief in a Savior who gave his life for us all and was resurrected so that we all will live again. Those who follow Him and keep His commandments will one day return and live with our Heavenly Parents and the Savior. Those who do not choose to do so will still have a wonderful kingdom to live in. This means that we all must choose good over evil by using our agency to choose. This was a big part of the plan. I find great peace in "The Plan of Salvation" sometimes called; "The Plan of Happiness. As always I enjoy reading your thoughts; they are always thought provoking.